I've decided lately that I need a little more organization in my life... and by a little, I mean A LOT. My former studio is now a baby room, which leaves me stuffing work supplies in every nook and cranny around the house. I'm currently working on a special project that, when completed, will leave me (hopefully) with a tidy house and a ton of motivation. Fingers crossed! That is GORGEOUS! 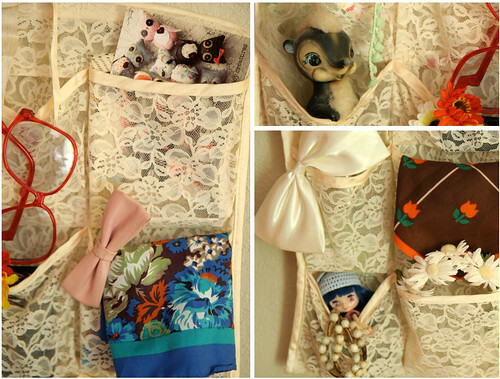 Love it - and definitely agree that it's easier to organise if you have cute storage! I love anything with lace! That is beautiful and I love how decorative and feminine it is! the organizer looks awesome. Way better than having all the clutter spread across the floor (not that that would ever happen in my room... haha). A new reader from Finland wants to say hello, so "hi!" 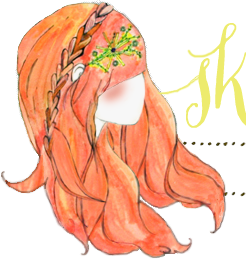 :) I love, LOVE your blog! You and I are on the same page! 1. that lace is gorgeous. 2. Organization is key. I have been using Wunderlist to help my mind stay organized lately. It has been helping so much! I want one like that, it's gorgeous! Anything with pockets and I am SOLD! This is so darling. oh my gosh thats exactly what I've been slaving away at for weeks. It feels sooo good to have everything organized. I feel like I have a new house!!! 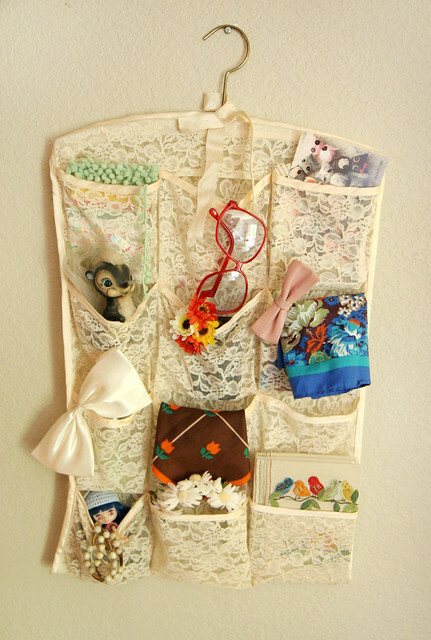 That lace organizer is FAB. This week has marked the transition from studio space into baby's room at our place - and in the meantime there's crap everywhere! I lay awake at night dreaming of nesting and organisation .... ahhh!